…more details. This edition uses 46x30x10mm magnets, and wire sizes are in mm. Get the right edition for your local magnet and wire sources! Uses 2″ x 1″ x 1/2″ magnets and wire sizes are in AWG. Get the right edition! using durable ferrite magnets, and simplified blade carving. I never use epoxy to cast a stator. I use Vinyl Ester resin mostly, but Polyester resin is also fine for the stator. I have made many stators with polyester resin (fibreglass resin). It’s fine for stators. For the magnet rotor I prefer to use Vinyl ester but it’s OK to use polyester for that too. Have fun. 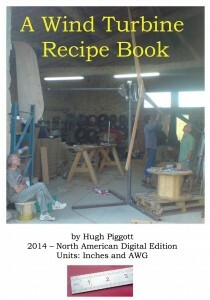 If you read my Recipe Book you will be OK.
Hi, Hugh, How are you,i live in UAE, and using your recipe book that i bought last year i am very late to start my windmill project, because i am not belong to engg. field and now i am facing some problem in your book page no 37 (1) and 56 (1,2). 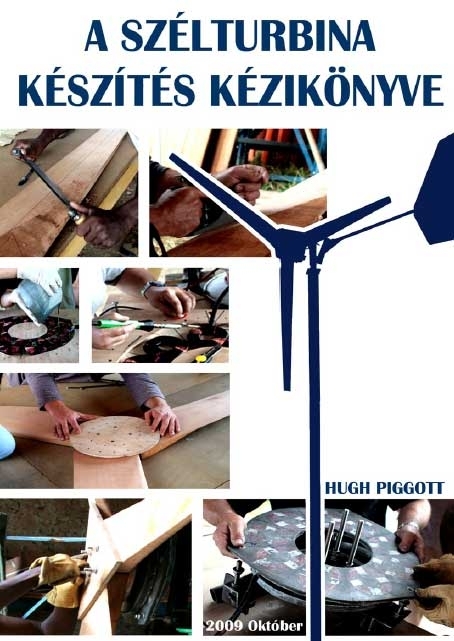 Page 37 (1) Turbine diameter 3000 mm at 48V : How you calculate Turns per coil 110. ? per phase 3 coil so total 110 x 3=330 per phase is it right ? Page 56 (1) What is the calculation for calculate the “B Tesla” and when i checked on online site “https://www.supermagnete.com/faq/flux” is not matching with your data, how you got this data 0.3, 0.44, 0.62 ?. Page 56 (2) ” Total series turns n = (DC V + 1.4) x 11 / (A x Bx rpm) ” from where this “11” no figure came and whats about the “2.72” no figure. sir do you have any Excel Sheet or any calculation software which you can share with me to easy my calculation. You can easily make a spreadsheet using the simple formulae that I have provided in the recipe book. You can check it against the results in the table on page 37. 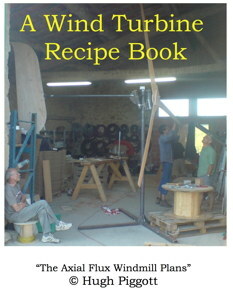 110 turns is the correct number for a 3m diameter machine if you follow the recipe and connect a 48V battery. I don’t understand your problem. You do not need to calculate it, but I have shown you how, if you follow these equations. B in the air gap will be approximately 0.62mT. Supermagnet.de are maybe telling you about Br which is much higher due to there not being any air gap but you cannot build an alternator like that. To get the maximum energy product form the magnets you must work with a B that is roughly 50% of Br. If you read the text carefully then you will find out that the constant 11 is derived from various other constants such as 60 seconds in one minute and root 3 and peak/average voltage. 2.71 = 1.73 x 1.57 But you don’t need to understand it in order to use it. I had hoped I made it clear how it is derived, but I only had a couple of spare pages in the book, so maybe the explanation is too brief. Sorry. My printer can only do 64 pages in this binding format, and mostly I wanted to fit in the practical detail needed. I hope that this answers your questions but if not then please ask again. Hi, Hugh, i live in Belize, and have attended a workshop on building wind turbine with Dan Bartman in the USA. 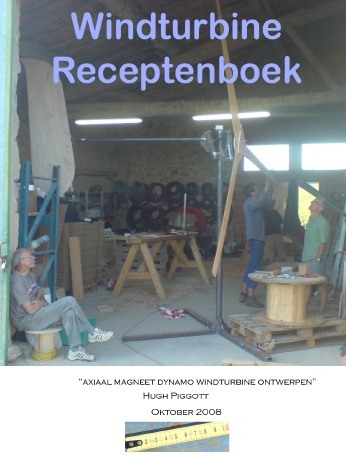 I am working with a Menonite friend of mine to build one for electrification in his house using your recipe book that i bought earlier this year. Shypyard community is open and houses are quite distance between and windy for most of the time. will a 50 feet tower be ok or do you recommend higher tower. Also can it support three light bulbs and a refrigerator? I mostly use forty foot towers here at Scoraig and they work pretty well although taller would be better. The answer to the light bulb question is it depends. Three 100W bulbs left on all of the time, probably not. Three 5W LED bulbs used only in the evenings yes for sure. 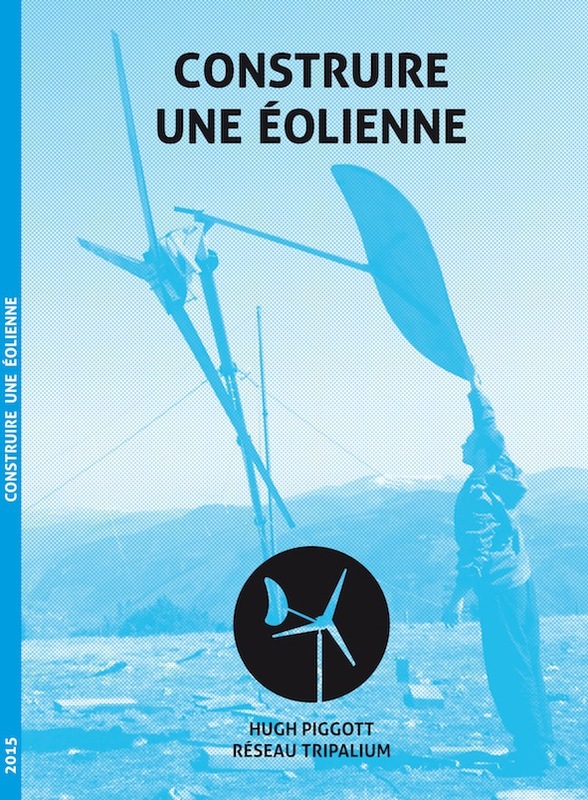 In between it depends on how big your turbine is and how windy it actually is. Fridges come in different sizes and of course it depends how hard they have to work, but most likely it will work some (or even most) of the time if the turbine is 8 foot or more in diameter. Sometimes if the wind stops maybe your battery will go flat so it’s good to have some PV panels and even a generator to charge them although you might not have to use it for months at a time. My advice is try it and see. But only if you are confident that it’s a windy place. If you want to be scientific about it then figure out the kWh you use and check the table in my Recipe book page 4. Hi friend, i am engineer (electrical) and a sailor, so I wonder if it is possible to bild a wind generator for my sailboat ( i think that 200/300w nominal power will be enough , but your opinion here is more reliable, of course) . The idea is to charge batteries and have a back up sistem to the main generator or the solar panel. I live in argentina but travel very often tu uruguay (sailing) and chile (car). 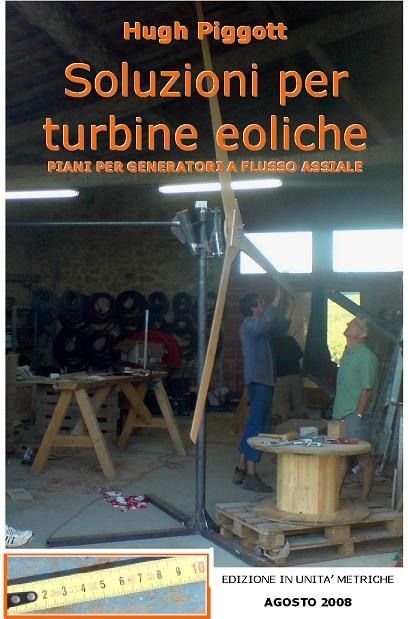 Yes of course it’s very possible if you have room on the sailboat for a large enough turbine to be useful. My recipe book describes a range of sizes. I have no idea how large your boat is so I can’t suggest a size for you. VAWTs are certainly crazy and I do not advise you to go crazy too but you can try if you like. 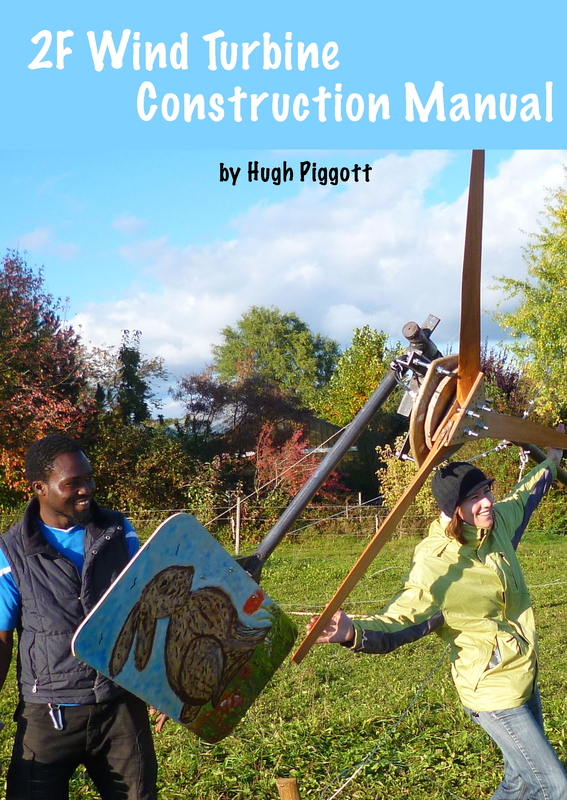 I recommend you use a proper windmill to get good results. Anyway the stator is no doubt doable but I would need a photo of the magnet rotors and an idea of the power/rpm details of the turbine and the battery voltage. Then I can advise for sure. Most VAWT enthusiasts have no idea of the power it can produce at a given rpm unfortunately, but you might be an exception? Boa noite!gostaria de saber a possibilidade do sr.hugh pigoth vir ao Brasil especificamente no estado do RS dar um de seus cursos. I want to consult about the airfoils of the blades used in your design. In a thesis it is referred that the airfoil of your blades’ design is based on a standard airfoil NACA 4412. My question is if it is true or not, because the schematic view of the airfoil in your book has a flat face in its bottom. The upper face of the airfoil is an approximation to a NACA 4412 or not? With those dimensions of 1x2x1/2 inch what should be the pulling force of the magnets? What if you cannot get under n42 – 72lbs? What will happen when altering that parameter? More pulling force equals more volts? I don’t use pulling force as a measure but I am sure it can be useful under controlled conditions. I mostly look at the “remanent flux density” Br. if the magnets are more powerful then you will get more voltage at lower speed. And vice versa. If you want to adjust the flux density then you can do so by changing the air gap (gap between magnet faces). The minimum gap is determined by the stator and you will need some sensible clearance each side of it. But if you increase the gap you will get lower voltage at the same speed or higher speed to produce a given voltage. I have a problem with building my turbine 1200 mm. In the market I’ve only found neodymium magnets 3-1-1 / 2 pulgadas.No magnets seem to find the correct dimensions . In the self-construction manual you recommend for this model magnets 46-30-10 mm or nearly 2-1-1 / 2 inches. ( Spanish version ) . I need to know whether the turbine built with these magnets have an inch but if this will affect the performance of it . Or failing that problem would build it with smaller magnets. I would appreciate your help on the issue , since I am excited about the project . I think it will be very expensive to use 3 inch magnets and I would have to completely redesign the alternator for you so it’s not very practical.